I hear that statement a good bit when people try to explain America’s healthcare problems to me. Basically, there are problems with healthcare in America and this results in lower-than-hoped-for life expectancy. We spend too much on medical tests. We diagnosis many diseases. But, we don’t follow through with managing them well, so our population doesn’t live as long as our competitors. I’ve even found myself, from time to time, nodding along with people making these statements and using this kind of reasoning. Then, it finally occurred to me. We actually have no idea what we are talking about. Correlation and causation are two terms that we get mixed up all the time. Me, included. Correlation is when two things track together. Like eating more ice cream correlated with increased incidence of Polio virus in the summer months throughout the early part of the twentieth century. One event may or may not be the cause of the other event at all. They just correlate. Causation is when one thing actually makes something else occur. Gravity caused the ball to drop to the ground. The nail that punctured the tire caused it to go flat. Seriously, what the heck is that supposed to mean? U.S. life expectancy has risen 8.5 years since Medicare and Medicaid started? Sure it has. You think Medicare and Medicaid had anything to do with that? Your guess is probably as good as mine. Differentiating between correlation and causation is often challenging, especially when it comes to understanding life expectancy. I suppose the quality of our “healthcare” system has some causative influence on the longevity of Americans, but I really have no clue about the degree. Americans work more hours per week than our industrialized counterparts. Maybe, you die sooner with that philosophy. Actually, this study says working longer makes you live longer. I’m just curious if eating tea and crumpets or routinely taking time for an afternoon siesta affects anything. Married people outlive single folks. And, yes, our divorce rate is comparatively quite high in the United States. Perhaps, that explains it. Maybe, we need less violent crime. Maybe, our banking industry or the origin of our legal system deserves some attention regarding this matter. Maybe we drive too many cars. Too many traffic accidents. Not enough people walking anywhere. Too much obesity. Maybe, all this stuff correlates, but is all of it causative? 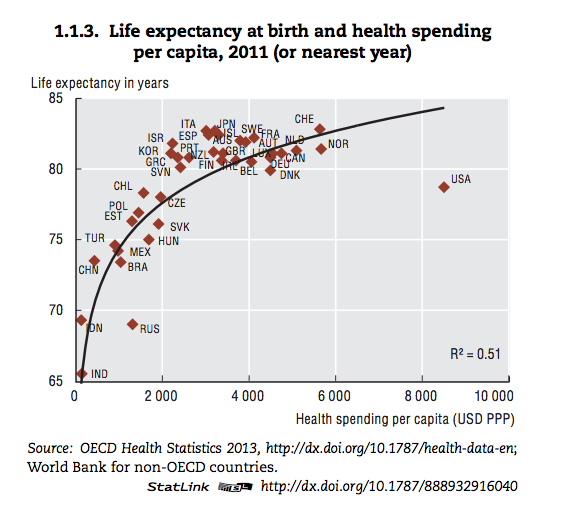 You see, our healthcare system may have everything to do with our life expectancy, or maybe, it’s an overrated influence. The irony is that in the last four decades, life expectancy in America has still nearly grown by an entire decade. Perhaps, it’s because of our healthcare system, or in spite of it, or maybe, almost unrelated to it at all. In fact, the only thing that’s really clear is that we enjoy spending money on medicine in America. We lead the pack in dollars spent per person. We blow the competitors away. In fact, we are 33% ahead of second place. That’s why it makes for such an interesting graph to plot that number, the dollars we spend on healthcare per person, on the same chart as any other variable where we find ourselves in the middle of the pack. Like, for example, life expectancy. Who knows how these two things really relate, but put them on a chart together, and the United States is alone in its own stratosphere somewhere (see below toward the right). The truth is that you don’t even need life expectancy as a variable on your graph’s vertical axis to make a bold statement at all. Pick any variable. And, as long as you still keep healthcare spending per person on the horizontal axis, you’ll always find the United States by itself on the right side of the page. The outlier here is really just our spending on healthcare. And, admittedly, the cause of that one is just as arguable. For example, a large number of medical innovations and technologies have poured out from the United States over the last half century. In fact, most of them have been exported all over the world. Dr. Michel Accad said that. And, he’s not implying that innovation in America, or our system here, is superior in any way. We have way too much to be embarrassed about. But, the first engine always costs more money to build than the last one. And, economically speaking, the funding for it ends up getting absorbed by someone. 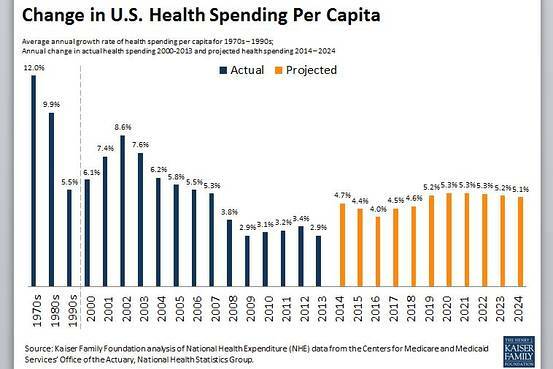 Still, I suspect that we will continue to find ourselves alone on the right side of the spending curve until healthcare costs become less of a mirage to the actual consumer. And, that’s going to take a paradigm shift for some of us. You see, both over-treatment and under-treatment in medicine are predominantly the result of an over-reliance on third-party payment for healthcare. For example, more than 1 in 10 Americans get an MRI (Magnetic Resonance Imaging) exam every year, a rate higher than any other country. And, how much does an MRI exam cost? Almost no consumer in America has a clue. The equipment charge might be $3,500, and the charge to read the exam might be $350, but who knows what money is really exchanging hands. Medicare might pay $500 for a government-funded patient to get an MRI of the brain. Is that a good deal? The same test costs $60 in India, where most people pay out-of-pocket. Why the discrepancy? I told you. Third-parties. If the insurers, hospitals, and equipment owners can keep costs a secret, and the person receiving the service isn’t directly paying for it at the time that it’s given, you can essentially make the cost whatever you want it to be. I hear from people all the time that we just can’t afford to pay directly for our healthcare in this country. That’s an obvious statement in our current system which thrives on unknown fees for nearly every type of service. But, that would change if we all started relying less on third-parties. The truth is that health insurance nowadays isn’t even real insurance anyway. Insurance is for unpredictable occurrences, like when your house burns down. You don’t need it when your light bulb burns out. Insure yourself for the unlikely scenario that you’ll need an emergent open heart surgery. Don’t spend $6,000 per year on the Silver Plan in order to get a free “wellness” visit and some annual blood work. You may not even need that stuff, but if you do, you can get it for $150 in my office. I’m even starting to look for ways to bring you some of these higher-ticket items at more affordable costs. Not just an MRI for under $200, but what if you could afford to buy your own pacemaker? Here’s the reality of that situation. The more we keep depending on a third-party for light bulbs, the harder it will be to make that happen. The more we keep supporting government mandates that require the purchase of over-priced Silver Plans, the further away we will get from a real solution. There was a time when no one imagined that a personal computer or a mobile phone could be affordable to use at home or in the palm of your hand. But, through competition and transparent pricing, the market took care of that. The truth is that the average American still spends nearly two-and-a-half times as much money every year on transportation than on healthcare. That’s right. We spend too much money on cars. And, I can only imagine what we would be spending if we bought insurance on the gas. But, who knows, maybe we really do know what we are doing. In fact, maybe we have stumbled upon our answer. Spend even more money on cars. To help with the lagging life expectancy. Other countries control costs with global budgets – supply side rationing. I don’t think people in the U.S. understand the pros and cons to this approach because everyone thinks they can get everything they want…somehow. I’d like to understand the “somehow”. Even your solution, which is certainly one that’s been explored, doesn’t explain what you do about the outliers that Jeff Brenner and others show cost all of us the most. Many (most?) consumers now do pay for a much larger proportion of their healthcare costs – I can’t see that it’s made that much difference. People still want unlimited ambulances, helicopters, chemotherapy, etc., etc., and that’s what will continue until there’s reason not to. Everyone wants to go from perfectly healthy to dead in short order – without even a costly 24 hour stay in an ICU bed. But how often does that happen? As you mentioned, our “entitlement” component, as it relates to spending in healthcare, is a worthy discussion. Ultimately long-lived “better” habits (in my opinion) seem to develop best out of persuasion and education, as opposed to restriction and coercion. But, admittedly, this last sentence of mine provides you with no concrete applications. The 80/20 rule (Pareto principle), as it relates here, is that 80% of the spending comes from 20% of the people. And, in healthcare, I’ve seen data that would even support this really being 90/10 or 95/5. Perhaps, we can and should look for ways to improve upon this, but I imagine that some degree of the Pareto principle will exist in any system. To be honest, I’m not certain if any of my solutions would end up working at all. Many seemingly “great” ideas, in theory, don’t pan out in practice, no matter how ideal their intentions. Indeed, a lot of our current problems seem to have originated from similar “great” ideas. I only would add, however, that I’m not certain how much this “solution” has really been explored in the United States. 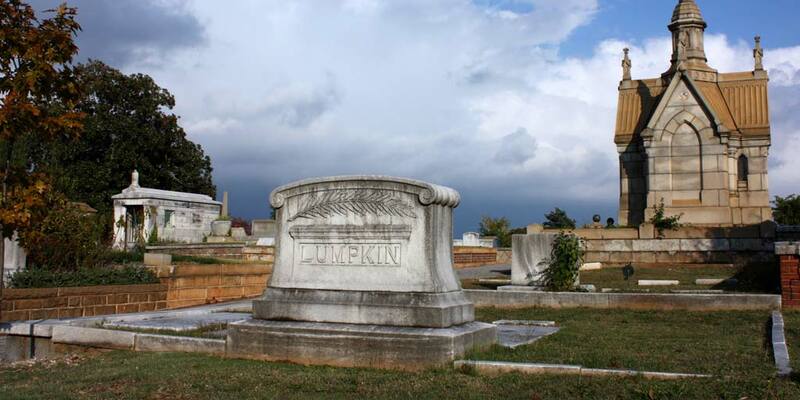 For decades, we have maintained an industry with unknown fees for every service. And, in a hidden market, I agree with you; people paying out-of-pocket, by itself, isn’t going to solve anything. We will just all pay the same exorbitant prices, out-of-pocket. But, for arguments sake, let’s say there will always be some degree of the 80/20 rule in effect. There will always be folks who “demand” a bunch of MRIs (until we can change that through persuasion and education), and I will always be a contributor (taxes) to that insurance pot. I would just prefer that those 30 million MRIs every year cost me a market-driven $60 (as in India), instead of that non-market driven and rather exorbitant currently unknown fee. I agree – I’m interested in trying as many solutions as possible, and I wish there had been an actual discussion before passing ACA rather than just some fake hearings where the people who had already decided were able to speak. Oh yeah – they’re called stakeholders. We need to keep them happy. But I’m paying attention to Jeff Brenner’s (Camden Coalition) suggestion – take care of the outliers – they won’t go away, and we can do a much better job with them. And he’s learned a lot from working in the trenches. If we could apply his lessons in more places, it could make a huge difference. But I agree, having lower cost, commodity care (i.e., MRIs) would help a lot of people, too. And, physician salaries in the U.S. have clearly been a low-hanging fruit regarding healthcare spending in recent decades (with physician net income relative to inflation declining over this time). The reality is that with only 8 cents of every $1 spent on healthcare in America attributable to physician salary, doctors could work for free and we would still have a healthcare spending crisis. Although I may be somewhat unique in my own transparency regarding income (all this and more, including my investment in medicine, is discussed in detail in my book), I know many other physicians share the following similarity with me. I’ve never complained about my salary. I make a great living and strive to find ways to give back. Frankly, I hope that I would have found a way to do the above in whatever occupation or industry I chose to pursue. And, yes, I’d ultimately be just fine with letting the market decide whether it wants a “rich” doctor or “poor” doctor taking care of it. 4. February 17, 2009: The American Reinvestment & Recovery Act enacted which includes the HITECH Act supporting the meaningful use of electronic health records (EMR-MU). Which of the above events have been/will be effective in increasing health care value (remember we want to decrease cost AND also increase quality, Value = Quality/Cost)? Perhaps the triple threat of these lifestyle trends account more for health care spending per capita than some other factors. It is because our health care system is so messed up, and the fact that I have only one payer choice on the exchange and plans outside the exchange cost too much that I have decided to not sign up for a health care plan this year. I plan on putting away into a savings account (to be “self-insured”) the amount that I was paying for my health care plan last year. It will not be an official HSA because those plans are too outrageously expensive for me at my age. I have to hope that nothing catastrophic happens anytime soon.